The word Merkaba or Merkava - Hebrew 'Chariot' or 'to ride an animal, in a chariot' - is used in the Bible (Ezekiel 1:4-26) to refer to the throne-chariot of God, the four-wheeled vehicle driven by four Cherubim, each of which has four wings and four faces (of a man, lion, ox, and eagle). Merkabah/Merkavah Mysticism (or Chariot mysticism) is a school of early Jewish mysticism, c. 100 BCE-1000 BCE, centered on visions such as those found in the Book of Ezekiel chapter 1, or in the hekhalot ("palaces") literature, concerning stories of ascents to the heavenly palaces and the Throne of God. The main corpus of the Merkabah literature was composed in Israel in the period 200-700 CE, although later references to the Chariot tradition can also be found in the literature of the Chassidei Ashkenaz in the Middle Ages. A major text in this tradition is the Maaseh Merkabah (Works of the Chariot). In Ancient Alien Theory the Chariot is a UFO. At the site of a plantation where abolitionist Frederick Douglass once lived archaeologists have uncovered striking evidence of how African and Christian religious beliefs blended and merged in the 19th century. 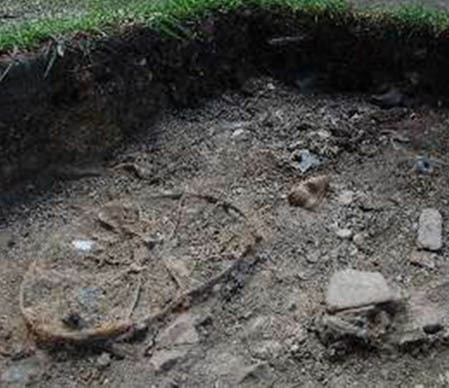 The team dug up an intact set of objects that they interpret as religious symbols - traditional ones from Africa, but mixed with what they believe to be a Biblical image: a representation of Ezekiel's Wheel. In medieval Judaism, the beginning of the book of Ezekiel was regarded as the most mystical passage in the Bible, and its study was discouraged, except by mature individuals with an extensive grounding in the study of traditional Jewish texts. 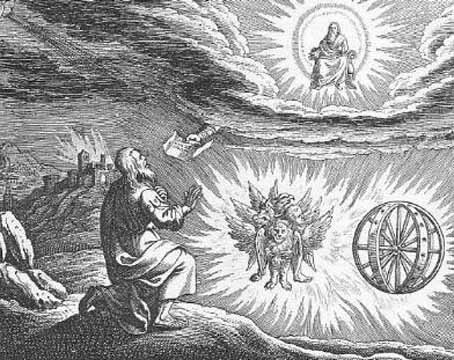 Jewish biblical commentaries emphasize that the imagery of the Merkaba is not meant to be taken literally; rather the chariot and its accompanying angels are analogies for the various ways that God reveals Himself in this world. Maimonides in his 13 principles of faith emphasies that God is not limited to any particular form, as this prophesy might seem to imply. Chassidic philosophy and Kaballah explain at length what each aspect of this vision represents in this world, and how they in no way imply that God is made up of these forms. The danger of understanding these passages as literal descriptions of God's image likely accounts for the opposition among Torah scholars towards learning this topic without the proper initiation. Jews customarily read the Biblical passages concerning the Merkaba in their synagogues every year on the holiday of Shavuot. 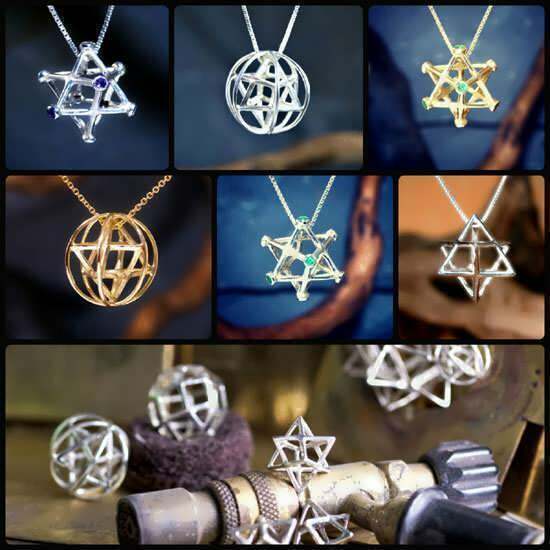 The earliest merkabah speculations were exegetical expositions of the prophetic visions of God in the heavens, and the divine retinue of angels, hosts, and heavenly creatures surrounding God. The earliest evidence suggests that merkabah homiletics did not give rise to ascent experiences - as one rabbinic sage states: "Many have expounded upon the merkabah without ever seeing it". The Talmudic interdictions concerning merkabah speculation are numerous and widely held. Discussions concerning the merkabah were limited to only the most worthy sages, and admonitory legends are preserved about the dangers of overzealous speculation concerning the merkabah. The sages Rabbi Yochanan Ben Zakkai (d. ca. 80 CE) and later, Rabbi Akiva (d. 135) were deeply involved in merkabah speculation. Rabbi Akiva and his contemporary Rabbi Ishmael ben Elisha are most often the protagonists of later merkabah ascent literature. Beyond the rabbinic community, Jewish apocalyptists also engaged in visionary speculations concerning the divine realm and the divine creatures which are remarkably similar to the rabbinic material. A small number of texts unearthed at Qumran indicate that the Dead Sea community also engaged in merkabah speculation. Recently uncovered Jewish mystical texts also evidence a deep affinity with the rabbinic merkabah homilies. Recently, considerable scholarly attention has been paid to the use of merkabah themes in early Jewish-Christian circles. The merkabah homilies eventually consisted of detailed descriptions of multiple layered heavens (usually seven in number), often guarded over by angels, and encircled by flames and lightning. The highest heaven contains seven palaces (hekhalot), and in the innermost palace resides a supreme divine image (God's Glory or an angelic image) seated on a throne, surrounded by awesome hosts who sing God's praise. 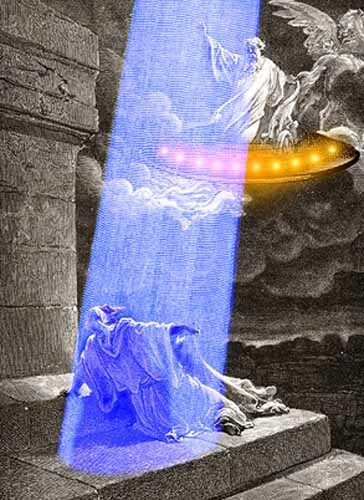 When these images were combined with an actual mystical experiential motif of individual ascent (paradoxically called "descent" in most texts) and union is not precisely known. By inference, contemporary historians of Jewish mysticism usually date this development to the third century CE. Again, there is a significant dispute amongst historians over whether these ascent and unitive themes were the result of some "foreign," usually Gnostic, influence, or a natural progression of religious dynamics within rabbinic Judaism. According to the verses in Ezekiel and its attendant commentaries, the analogy of the Merkaba image consists of a chariot made of many angels being driven by the "Likeness of a Man." Four angels form the basic structure of the chariot. These angels are called the "Chayot". The bodies of the "Chayot" are like that of a human being, but each of them had four faces, corresponding to the four directions the chariot can go (north, east south and west). The faces are that of a man, a lion, an ox (later changed to a child or cherub) and an eagle. Since there are four angels and each has four faces, there are a total of 16 faces. Each Chayot angel also has four wings. This created a sort of 'box' of wings that formed the perimeter of the chariot. With the remaining two wings, each angel covered its own body. Below, but not attached to the feet of the "Chayot" angels are other angels that are shaped like wheels. These wheel angels, which are described as "a wheel inside of a wheel", are called "Ophannim" - wheels, cycles or ways). These wheels are not directly under the chariot, but are nearby and along its perimeter much like the wheels of a car. The angel with the face of the man is always on the east side and looks up at the "Likeness of a Man" that drives the chariot. The "Likeness of a Man" sits on a throne made of saphire. 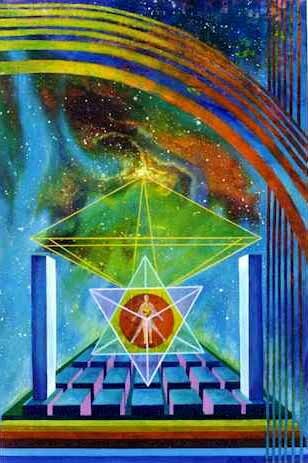 The Bible later makes mention of a third type of angel found in the Merkaba called "Seraphim" (lit. burning) angels. These angels appear like flashes of fire continuously ascending and decending. These "Seraphim" angels functioned somewhat like pistons in that they powered the movement of the chariot. In the hierarchy of these angels, "Seraphim" are the highest, that is, closest to God, followed by the "Chayot", which are followed by the "Ophannim". The chariot is in a constant state of motion, and the energy behind this movement runs according to this heirarchy. The movement of the "Ofanim" is controlled by the "Chayot" while the movement of the "Chayot" is controlled by the "Serafim". The movement of all the angels of the chariot are controlled by the "Likeness of a Man" on the Throne. Chassidic philosophy explains that Merkaba is a multi-layered analogy that offers insight into the nature of man, the ecosystem, the world, and teaches us how to become better people. The four Chayot angels represent the basic archetypes that God used to create the current nature of the world. Ofannim, which means ways, are the ways these archetypes combine to create actual entities that exist in the world. For instance, in the basic elements of the world, the lion represents fire, the ox earth, the eagle wind, and the man water. However, in practice, everything in the world is some combination of all four, and the particular combination of each element that exist in each thing are its particular Ofannim or ways. In another example, the four Chayot represent spring, summer, winter and fall. These four types of weather are the archetypal forms. The Ofannim would be the combination of weather that exists on a particular day, which may be a winter-like day within the summer or a summer like day within the winter or whatever. The Man on the throne represents God, who is controlling everything that goes on in the world, and how all of the archetypes He set up should interact. The Man on the throne, however, can only drive when the four angels connect their wings. This means that God will not be revealed to us by us looking at all four elements (for instance) as separate and independent entities. However, when one looks at the way that earth, wind, fire and water (for instance) which all oppose each other are able to work together and coexist in complete harmony in the world, this shows that there is really a higher power (God) telling these elements how to act. This very lesson carries over to explain how the four basic groups of animals and the four basic archetypal philosophies and personalities reveal a higher, godly source when one is able to read between the lines and see how these opposing forces can and do interact in harmony. A person should strive to be like a Merkaba, that is to say, he should realize all the different qualities, talents and inclinations he has (his angels). They may seem to contradict, but when one directs his life to a higher goal such as doing God's will (the man on the chair driving the chariot) he will see how they all can work together and even complement eachother. Ultimately, we should strive to realize how all of the forces in the world, though they may seem to conflict can unite when one knows how to use them all to fulfill a higher purpose, namely to serve God. The ascent texts are extant in four principal works, all redacted well after the third but certainly before the ninth century CE. They are: 1) Hekhalot Zutartey ("The Lesser Palaces"), which details an ascent of Rabbi Akiva; 2) Hekhalot Rabbati ("The Greater Palaces"), which details an ascent of Rabbi Ishmael; 3) Ma`aseh Merkabah ("Account of the Chariot"), a collection of hymns recited by the "descenders" and heard during their ascent; and 4) Sepher Hekhalot ("Book of Palaces," also known as 3 Enoch), which recounts an ascent and divine transformation of the biblical figure Enoch into the archanel Metatron, as related by Rabbi Ishmael. A fifth work provides a detailed description of the Creator as seen by the "descenders" at the climax of their ascent. This work, preserved in various forms, is called Shi`ur Qomah ("Measurement of the Body"), and is rooted in a mystical exegesis of the Song of Songs, a book reputedly venerated by Rabbi Akiva. The literal message of the work was repulsive to those who maintained God's incorporeality; Maimonides (d. 1204) wrote that the book should be erased and all mention of its existence deleted.While throughout the era of merkabah mysticism the problem of creation was not of paramount importance, the treatise Sefer Yetzirah ("Book of Creation") represents an attempt at cosmogony from within a merkabah milieu. This text was probably composed during the seventh century CE, and evidences influence of Neoplatonism, Pythagoreanism, and Stoicism. 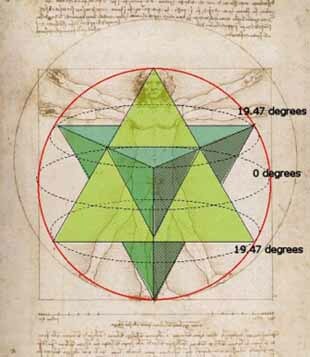 In his books, researcher and physicist Drunvalo Melchizedek describes this figure as a "Star Tetrahedron", since it can be viewed as a three dimensional Star of David. 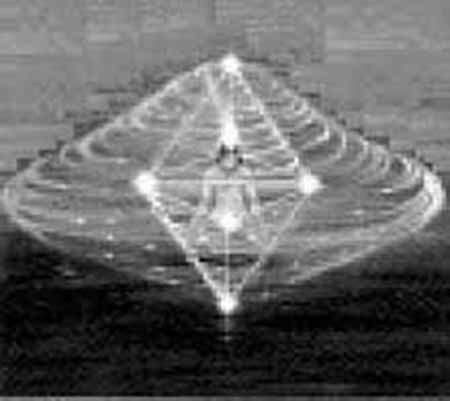 By imagining two superimposed "Star Tetrahedrons" as counterrotating, along with specific "prana" breathing techniques, certain eye movements and mudras, it is taught that one can activate a non-visible 'saucer' shaped energy field around the human body that is anchored at the base of the spine. Depending on the height of the person doing the exercise, this field is about 55 feet across. Once activated, this 'saucer' shaped field is capable of carrying ones consciousness directly to higher dimensions. There are 17+1 breaths, where the first six are for balancing the polarity, the next seven for proper pranic flow through the entire body. 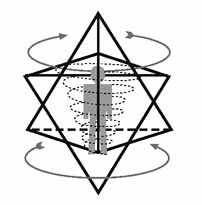 The further breaths are for shifting the consciousness from 3rd to 4th dimension and finally the last three breaths is for re-creating the rotating Merkabah within and around the body. The last breath is not taught. Once each day, enter into this meditation, until the time comes when you are a conscious breather, remembering with each breath your intimate connection with God. BREATH: Breath Yogic and rhythmically and deeply again, but only for the next three breaths, after that return to the shallow breathing.